In July we visited grandma in Shrewsbury, England. Lovely little town with a lovely fabric shop. My kids immediately saw this fabric and wanted it. They just wanted it. I've been wanting to make them some shorts, but I had thought of something a bit more classic, like stripes. 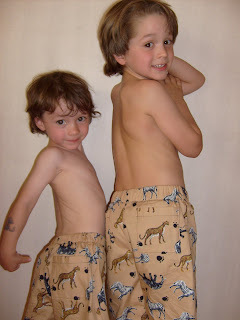 I would never have chosen this "safari" fabric, but my kids wouldn't have been more pleased with their shorts! 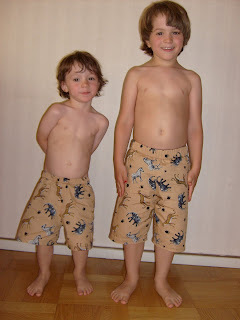 They love their shorts and wear them all the time. Shame Summer is almost over, over here! I used the pijama pattern in Heather Ross' Weekend Sewing but cut the leg shorter and added 2 pockets on the back. I bought lots more fabric there as well! More photos later! Acho que eles fizeram uma boa escolha. Os calções ficaram muito giros!